This magnificent necklace features ACRYLIC BEADSGLASS BEADSAmethyst AGATE BEADS ENAMELED HEART PENDANT IN ANTIQUE GOLD COLOR with RESIN SMALL HEART ON A BIG HEART 18 inches long necklace with Striking Stunning Heart Pendant wtih acrylic bead Tassel. A cluster of iridescent Necklace with Stunning pendant would look pretty with many of dresses. Celebrate your individuality. 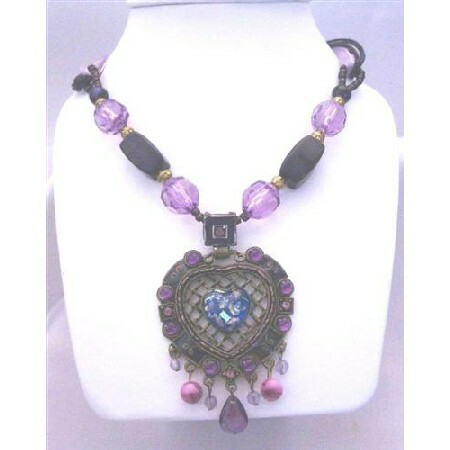 Variations in the color & pattern of each amethyst purple & black beads beauty to the necklace.